The Mississauga Steelheads saved an epic comeback for the final day of the season, climbing to fifth in the Eastern Conference with a 5-4 win over the visiting Barrie Colts. Down 4-1 with six minutes to go in the third period, the Trout scored four unanswered goals as Cole Schwindt (18, 19) completed the comeback with 1:56 remaining on the clock. Schwindt finished with two goals and two assists while overage forward Alan Lyszczarczyk (38, 39) had a season finale to remember with a pair of goals and an assist on the game winner, giving him 82 points (39-43–82) on the year. Nick Isaacson (14) also scored for Mississauga as the Steelheads leapfrogged the Peterborough Petes to set up a first round date against the Sudbury Wolves. Aidan Brown (14), Ryan Suzuki (25), Riley Piercey (3) and Tyson Foerster (10) all scored for Barrie as the Colts wrap things up with six straight losses, falling to 26-38-3-1 outside of the Eastern Conference playoffs. The Trout end their season with a 32-29-5-2 record. 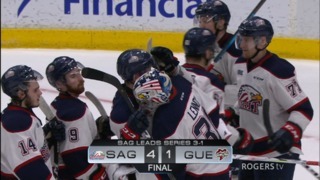 The Oshawa Generals chased Sudbury’s Ukko-Pekka Luukkonen early, skating to an 8-2 win over the visiting Sudbury Wolves to secure third in the Eastern Conference on the last day of the season. The Generals passed the Wolves in the standings as Montreal Canadiens prospect Allan McShane (33, 34) was the star of the show with two goals and three assists while Serron Noel (33, 34) had a pair of goals and a helper. Brett Neumann (44, 45) also scored twice while overage centreman Brandon Saigeon picked up four assists. Anthony Salinitri (48) and Nando Eggenberger (25) added singles for the Gennies while Kyle Keyser made 28 saves in goal. Darian Pilon (18) and Oshawa-area product Jack Thompson (6) scored Sudbury goals as the Wolves ended things with a 43-20-3-2 record for fourth in the Eastern Conference. Sudbury will face Mississauga in first round play while the 44-20-4-0 Generals will take on the East Division rival Peterborough Petes. The Soo Greyhounds took it to the visiting Saginaw Spirit, outshooting them 52-31 in a 5-2 win. The Hounds jumped out to a 5-0 lead on a pair of goals from Zack Trott (12, 13) while Tye Kartye (4), Jordan Sambrook (17) and Drew Wawrow (1) added singles. The Spirit got a 47-save performance from rookie netminder Tristan Lennox while Sault Ste. Marie rookie Ethan Taylor made 29 saves for the win. Albert Michnac (20) and Camaryn Baber (8) scored third period goals for Saginaw. The West Division champion Spirit edged out the Hounds for the division title as the result of a head-to-head tie-breaker. 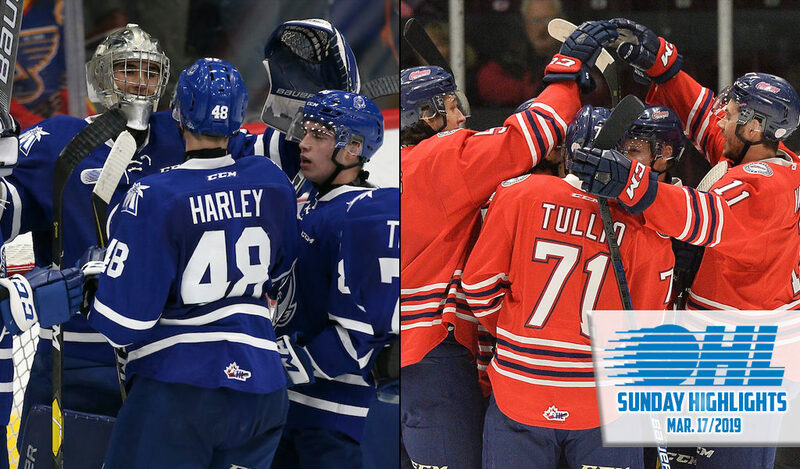 The Spirit end their season with a franchise record 45-17-3-3 record as they prepare to face the Sarnia Sting in first round action. Sault Ste. Marie finishes at 44-16-7-1 for third in the conference as they prepare for the Owen Sound Attack. The Niagara IceDogs secured the 2019 Central Division title thanks to a goal and two assists from OHL scoring champion Jason Robertson (48) who led all players with 117 points. The Dogs struck for five first period goals as Bradey Johnson (10, 11) scored a pair, joining Robertson, Ben Jones (41), Ivan Lodnia (17), Philip Tomasino (34), Akil Thomas (38) and Elijah Roberts (6) on the scoresheet. Brad Chenier (30), Justin Brazeau (61) and Matthew Struthers (31) scored North Bay goals as Chenier and Brazeau each finished with a goal and two helpers. The 44-17-7-0 IceDogs win their first Central Division title since 2012 as they prepare to face the seventh place 30-33-3-2 Battalion in first round action. 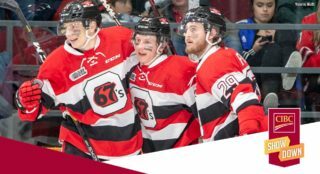 The OHL regular season champion Ottawa 67’s set a new franchise record with 106 points, blitzing visiting Kingston by a score of 8-3 for their 50th win of the season. 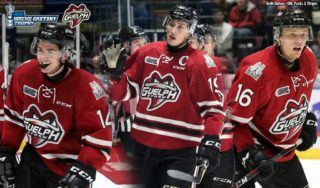 San Jose Sharks prospect Sasha Chmelevski (33, 34, 35) scored a hat-trick, recording his 100th career OHL goal in the process while Austen Keating racked up five assists. Tye Felhaber (59) and Graeme Clarke (23) each added a goal and two assists while Marco Rossi (29), Lucas Chiodo (29) and Merrick Rippon (6) also lit the lamp. Noel Hoefenmayer picked up two assists to give him 62 points on the season, the most by a 67’s blueliner since Jonathan Zion in 2001. Adrien Beraldo (9), Ryan Cranford (19) and Ian Derungs (10) scored for the Frontenacs who suffered their fifth straight loss, finishing the season at 14-52-1-1. Ottawa outshot Kingston 53-17, going 3-for-6 on the power play. The 67’s prepare to face the Hamilton Bulldogs in first round action. The Frontenacs set a new OHL record for the fewest goals scored in a season (144), one fewer than the 1999 Mississauga IceDogs. 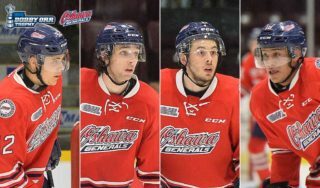 They’ll pick first in the 2019 OHL Priority Selection. The Sarnia Sting rebounded from a Saturday night loss in Flint, defeating the Firebirds 6-3 on home ice to end the season. 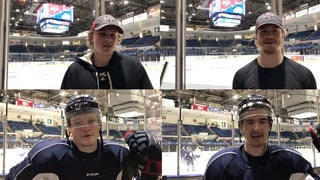 Rookie standout Jacob Perreault reached the 30-goal mark while Hugo Leufvenius (37), Colton Kammerer (5), Calvin Martin (14), Nolan DeGurse (1) and Anthony Tabak (3) also tallied. The Sting outshot the Firebirds 46-21 as Ethan Langevin made 18 saves for the win. Cody Morgan (14, 15) potted a pair of Flint goals while captain Ty Dellandrea (22) also scored. Flint’s Emanuel Vella made 40 saves in his final OHL start. The 28-33-5-2 Sting head into the playoffs where they’ll face the Saginaw Spirit in first round action. The Firebirds played to an overall mark of 16-46-6-0, winning five of their last 10 games. 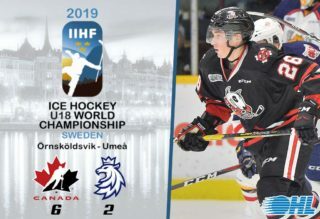 They’ll pick second in the 2019 OHL Priority Selection.